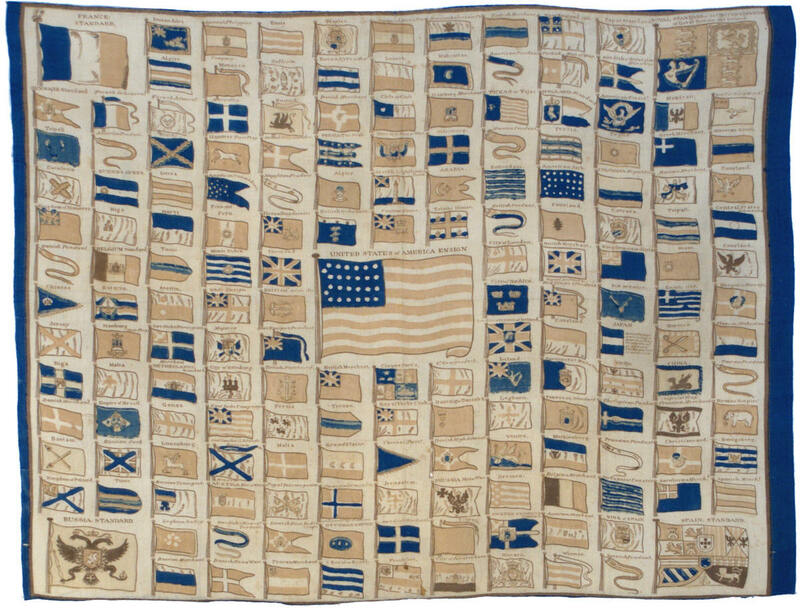 This flag is special and extraordinary not only as one of the earliest examples of the beloved "Great Star" pattern of American Flags, but also as one of the earliest printed flags known, and furthermore, a flag with specific provenance to the Decatur family, one of America's earliest and most renowned naval families. 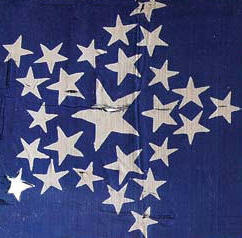 Captain Samuel Reid, an American naval hero of the War of 1812, designed the Great Star pattern in 1818, as a novel way of incorporating the growing number of stars into the canton. Reid's experience as a mariner, having to determine the nationality of a ship at long distances from its flag, most likely informed his decision to propose such a bold, beautiful and easily recognizable design. In the second quarter of the 19th century, the Great Star pattern emerged as one of the predominant forms of American flags, and remains today as one of the most beautiful expressions of the American Union. The earliest known printed flags consist of those with 26 stars, dating to the period Michigan's statehood from 1837 to 1845. Surviving examples from this period are extremely rare, and are typically known in just a handful of styles: an interesting row configuration with two side outliers and four even rows of six stars each, or two variants of the great star pattern, of which this is one. The colors of this flag are extremely vibrant and beautiful, especially considering that the flag was block-dyed over 170 years ago. There are minor splits in the silk, but the losses on the hoist, especially in the corners, and the wear at the fly end, indicates that the flag was most likely flown for some period of time. 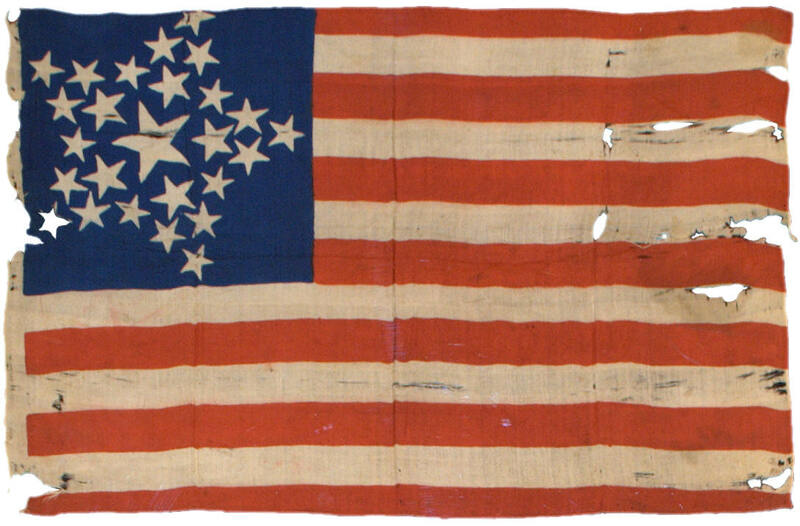 There are letters and notes from the Decatur family indicating that this silk flag was owned by Commander Stephen Decatur and used by him in 1815 when he took command of the squadron bound for the Mediterranean. Family records also indicate that the flag along with numerous other Decatur objects were leant to the Naval Historical Foundation 1950 for a special exhibit and also to be included in a book. However, the 26 stars on the flag represents the state of Michigan which came into the Union on July 4, 1837. 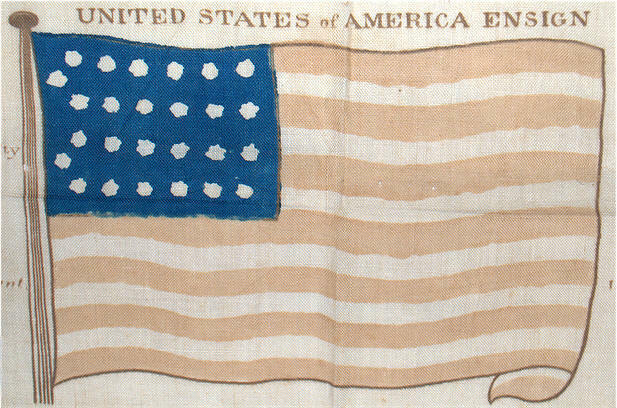 In addition, the lithography process utilized in making flags did not begin to be used until some time in the 1820s. The likelihood is that this flag was used by Stephen Decatur but it was Lt. Stephen Decatur son of John Pine Decatur and namesake of his famous uncle. Lt. Stephen Pine Decatur who was appointed Lieutenant on March 2, 1841 and was assigned to the Sloop Warren. It is believed that he saw service in the Mexican war and the dates of this flag would be appropriate for his use and it may be this Stephen Decatur that earlier family members meant to designate. It is indeed a wonderful historical flag having descended from one of this country’s most illustrious nautical families. pattern of the period--four rows of six stars with two end outliers. This kerchief was found in London, where it was most likely made for the American market. Its purpose was for sailors to use at sea to help identify vessels. The kerchief is printed on cotton, which would have been more survivable at sea, whereas paper would be more likely deteriorate in the wet and salty environment. It is unusually large, at 24" x 32", and, for a cotton item over 170 years old, survives in an exceptional state of preservation.